People’s Day is South East London’s longest-running free festival and is curated each year by the London Borough of Lewisham. The Festival is a celebration of music, art, craft and community, which attracts over 25,000 visitors. At the 34th People’s Day on 7 July in Catford’s Mountsfield Park, included hundreds of performances across seven stages, craft stalls and great food and drink. London Calling was tasked with the challenge of engaging locals during the 4 weeks leading up to the festival. 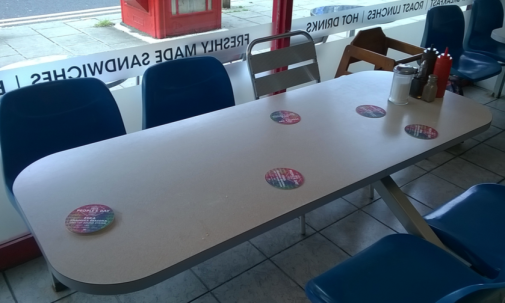 London Borough of Lewisham provided us with a figure of 12,000 coasters to be distributed to their key areas. In order to manage the geographical scope of the campaign and the relatively short time frame the team researched groups of 60 venues in each area that would be eligible to take a coaster. Our drivers were then armed with a wishlist of ideal venues in each area to be completed within one day to the coasters had maximum display time. 240 local venues targeted with bundles of 40/50 coasters delivered to each venue. Photo feedback of each venue recorded in a feedback report as well as list of all the venues targeted.